The corporate culture of employee-driven innovation at Dubai Aluminium (Dubal) has earned the UAE-based primary aluminium producer Gold in the 2013-2014 American Society for Quality (ASQ) International Team Excellence Awards (ITEA). The award, presented during the ASQ’s World Conference on Quality and Improvement in early-May 2014, is a singular honour, as this is the first time that any company from the UAE and the greater Mena region has been selected as a finalist in the ASQ ITEA competition, a statement said. The winning Dubal entry entitled “Stub Repair Reduction” was submitted by the Reduction Materials team. A second Dubal entry entitled “Reduction of PFC emissions”, submitted by the Potrooms team, also progressed through the preliminary phases to become a finalist in the competition. Ranked by many as best-in-class, the process for the ASQ ITEA competition is highly competitive, with participating teams having to satisfy stringent and exhaustive criteria prior to selection. The DUBAL entries competed in a set of 38 finalists from 32 organisations and 14 countries. Dubal’s achievement in the competition reflects the emphasis placed on excellence through continuous innovation by Emirates Global Aluminium (EGA), the jointly-owned, UAE-based aluminium conglomerate formed by Mubadala Development Corporation and Investment Corporation of Dubai through the combination of their respective aluminium industry interests, said the statement. 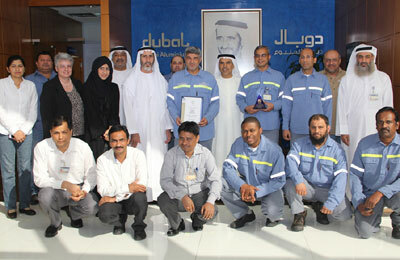 Dubal is an operating subsidiary of EGA, alongside Emirates Aluminium (Emal). It also attests to the performance-based work culture encouraged across EGA, whereby individual employees are empowered through ownership, accountability and team support.